A conversation on the future of Myanmar’s economy, and the implications for domestic and international actors. Since historic elections in Myanmar in 2016 brought to power the country’s opposition led by Aung San Suu Kyi, the ruling National League for Democracy (NLD) has come under scrutiny for its performance and the pace of reforms in the country. Among the major areas in question is the economy. The economic realm continues to be watched closely today, not just for its own sake but also in the context of broader trends and developments, including Myanmar’s alignments with foreign powers and domestic perceptions of the government heading into elections expected sometime in 2020. The Diplomat’s senior editor, Prashanth Parameswaran, recently spoke to Erin Murphy, principal of Inle Advisory Group who previously worked for the U.S. government in several roles including as a special assistant to the U.S. special representative and policy coordinator for Burma, about the state of Myanmar’s economy, its future trajectory, and the implications for domestic and international actors. Even though the NLD government had initially been slow to undertake some economic reforms, there have been some steps taken in the past few months that suggest that it is receptive to the need to accelerate efforts in this regard. What is your sense of how the government has fared on the economy thus far on balance, taking into account what is has accomplished and what remains to be done? What are some key agenda items that lie ahead? The NLD missed an opportunity to focus on an area where they had extensive constitutional leeway and authority: the economy. The NLD’s initial and primary focus on national reconciliation — to be fair, Myanmar’s defining issue and one that needs attention — came to the detriment of everything else. Adding to that is a distrust of the private sector and wariness of for-profit businesses; there is a real tension in recognizing the need for FDI but being wary of implications, probably influenced by cronyism and economic exploitation. 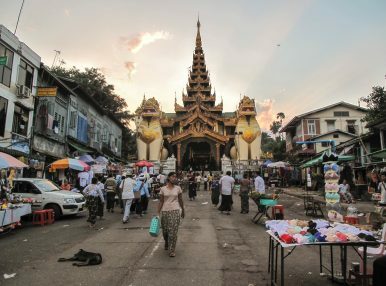 The NLD is likely to ramp up reforms and its economic activity, mostly because they recognize what are key voter issues that are not unique to Myanmar: it’s the economy, stupid. And hopefully it’s not too late for them to turn their reputation on the economy around. August 2018 has been a turning point, when the government announced the Myanmar Sustainable Development Plan which more clearly outlined their priorities and goals. They need to create jobs, address infrastructure issues like electrification and transportation, and balance this in a way that doesn’t reflect the way business has been done in the past. State Counsellor Aung San Suu Kyi has said she wants Myanmar to become like Singapore but that means she has to take steps Singapore initially took, including opening the country up to foreign investment. There are several risks and challenges to the state of Myanmar’s economy this year, whether it be internal ones such as ongoing conflict in parts of the country, or external ones such as restrictions imposed by outside actors or broader strategic trends such as intensifying U.S.-China strategic competition. What is your sense of these risks and challenges, as well as how the government will be able to manage them? At this stage, most current and potential investors know what the risks are — capacity, infrastructure, and in some cases, sanctions and financial restrictions — but they are mainly centering investment in urban areas like Yangon and Mandalay and areas in Myanmar’s central corridor. The risks and challenges in the country’s periphery, where the majority of natural resources are located as well as active conflict, is inherently greater. However, this is where investment and engagement is needed but must be done so in a careful and sensitive way; that cannot be emphasized enough. The government is taking some interesting decentralization steps and allowing states and regional chief ministers (similar to U.S. governors) to attract and approve foreign and local investment projects. Local governments have held investment seminars and have offered proposals and clear guidance on investment. But any investor (or NGO, nonprofit, or foundation) will have to do extensive stakeholder engagement to understand the dynamics and the sensitivities on the ground. The government is going to be limited (and perhaps not as empathetic) to the extent of the issues and it will be up to whoever is working in these areas to do so. While there were initially a range of partners that took an interest in Myanmar to varying degrees and in different areas, including China, Japan, the United States as well as a number of Southeast Asian and European countries, there has been some relative change in this balance amid concerns about the direction of the country and even some potential or actual restrictions. To what extent has this impacted Myanmar’s current mix of partners on trade, investment, and development assistance, and are there particular effects or trends that are notable? Most of the restrictions (or calls for restrictions) have come from Western countries (gems and jade, rice, garments, banking) and that has had more of an impact on Myanmar’s attitude toward investors than the other way around. In the February Invest Myanmar Summit, there were calls by the NLD government to “Look East;” North and Southeast Asian countries had fewer restrictions, were more willing, and were less critical of Myanmar, so that’s where the outreach should be. The restrictions have somewhat limited Western companies, particularly the financial ones, but it was the state of the Myanmar economy and the investment environment that really prevented more extensive Western investment. Development, however, is another story. Myanmar dropping to Tier 3 on the Trafficking in Persons list will have a significant impact, and in my opinion, will undermine the very efforts of reform the U.S. wants to see. The U.S. has to block any assistance to the government (with very few exceptions) meaning that any capacity building programs and direct assistance will be blocked and USAID, ADB, World Bank, and IFC will have to either shift gears completely or put their programming on hold. Other development agencies can still work on these programs but it means a potential overhaul of programming in a short time and perhaps that do not play to that particular agency’s strengths. Myanmar is also part of broader economic efforts by key countries, such as China’s Belt and Road Initiative or Japan’s Partnership for Quality Infrastructure. While Myanmar is no stranger to balancing between major powers, what is your assessment of how Naypyidaw is managing its role thus far with respect to these various initiatives from major powers as it attempts to secure its own interests? Myanmar has always operated from a place of insecurity and a strong sense of protecting its sovereignty (economically, politically, and militarily), being sandwiched between China and India and at the crossroads of South, Southeast, and Northeast Asia. Being a part of multiple global strategies is not new but it is increasingly difficult to balance these relationships. Myanmar has tried to maintain a non-aligned status for decades and when the country opened and restrictions were eased, it tried to balance economic and military relationships so that one country did not have an advantage over the other. Naypyitaw will always have to deal with China (and has no interest in nor is close to being a proxy state, despite claims that it essentially is) and that is a fact of life for Myanmar. But as seen in the previous decades, with greater restrictions, condemnation, and sanctions, the country has fewer options in who it can engage, trade, and work with, allowing countries like China to gain a stronger foothold and more influence. The trajectory Myanmar has taken during the NLD’s time in power thus far, and the response to it, has also triggered questions about the United States’ role in the country, especially given the Obama administration’s initial engagement of Naypyidaw, which has now been scaled back to some degree. As someone who worked on this during the Obama administration and continues to work in Myanmar today, what has the trajectory of the country so far suggested about what the right balance in a U.S. approach ought to be to Myanmar, both by the government but also by nongovernment entities such as businesses? Is there more that can be done under the Trump administration to better manage the relationship, and, if so what might some examples of this be? I will say that when I hear sanctions get mentioned or see yet another bad headline on Myanmar, I am worried people will give up and abandon the place at a time that is most critical for more engagement. We’re in the slog now which should’ve been expected after the initial opening; this is where the hard work begins. I’m not suggesting to ignore the violence and human rights abuses and move along as if nothing has happened, but I do believe that engagement at every level is necessary to keep the political and economic reforms continuing. For investors and nongovernment entities, I would say to keep your eyes wide open on the challenges in the country and work in a way that reflects international standards and does no harm. Sounds simple but there are plenty of communities in urban and rural areas that have not been informed about projects or investment that is happening in their backyard until its already underway. Local governments are also more empowered and will be a good resource and stakeholder to consider. For the Trump administration and Congress, the balancing in messaging is key. Again, call out Myanmar for what it’s doing but also reflect that the U.S. has been committed to a better Myanmar for decades. We shouldn’t be a fair-weather friend; if we are a friend, we need to be able to highlight issues that are of concern but also show where we can work together with appropriate action. The U.S. should give credit where it is due to encourage more progress and not just focus on the negative, which has been really easy these last few years. Looking ahead to the rest of 2019 and into elections expected in 2020, what are some of the key signposts that you will be looking at to assess the government’s performance on the economy? To what extent and in what ways do you expect economic issues to factor into voters’ calculations in the upcoming elections? The NLD government has been strongly urged to really reform and modernize the financial sector. I would look for more significant steps in allowing foreign banks to operate and taking aims to further reform the Central Bank, especially its leadership. I would look for more competitive and timely tenders and license round in sectors, particularly those in monopoly-dominated sectors, to be issued. The former USDP government used public tenders to demonstrate transparency and reform-mindedness; the NLD may have to do the same to earn back the international community’s trust on the economy. Additionally, taking more tangible steps on reforming state-owned enterprises would be another way to open up the economy and start changing the way the country does business. I do think economic issues plays a role for voters but I think voters, at least the ethnic Bamar, still believe in the NLD and are still more interested in further ensuring the military’s role in politics diminishes. That said, job creation and electrification are high on everyone’s list. Making little to no progress on that will impact the polls. Myanmar: Elections and the MediaThe (Few) Generals That Don’t Exit in MyanmarBig Year for Myanmar Economic ReformsWhy Myanmar's New Insurance Market Opening MattersAung San Suu Kyi: A ‘Moral Democrat’ or a ‘Precolonial Queen’?